We know that Call of Duty: Black Ops' second map pack, "Escalation," will apparently be launching this May - but Activision hasn't announced it yet. The website for the Australian branch of GAME posted a flyer on its website advertising Black Ops' second map pack. Nothing out of the ordinary there, right? After all, you want your customers to know all about the latest and greatest DLC packs, naturally. The only problem was that officially, the Escalation map pack didn't exist yet. Oops. GAME reacted quickly to pull the electronic flyer down, but the internet has a long memory, and it was posted in its entirety over at VG247. 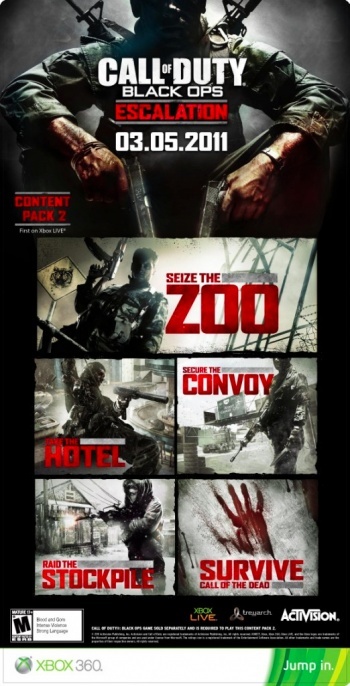 As far as content goes, the Escalation pack will bring five new maps to Call of Duty's multiplayer: Four standard "shoot the other guys in the face" locales, and one new anti-zombies campaign. Thanks to the big red letters on the poster, we know the sort of settings in which players will be murdering each other by the millions. It's fairly standard stuff - a hotel, a convoy mission, and a stockpile assault - but the interesting one is the headliner, a new map which supposedly takes place inside a zoo. Will there be animals there? Can we unleash tigers on our enemies - or at least have them take care of those blasted attack dogs? If not, that would seem like a thoroughly wasted chance to allow Treyarch to flex its chops as a developer and come up with some interesting scenery beyond just "war-torn urban landscape." Of course, if you could shoot endangered animals like lions and tigers, you'd probably get PETA breathing your neck, so maybe it's for the best. We'll learn more when the map pack is officially announced. It's currently slated for May 3rd on Xbox 360, and sometime later for PC and PS3 thanks to Activision's timed-exclusivity deal with Microsoft.